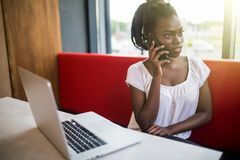 Pretty black woman on cell phone and laptop. 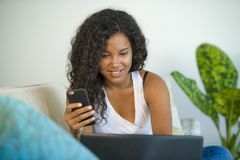 Lifestyle portrait of young happy and beautiful black latin American woman using internet mobile phone while working on laptop co Businesswoman, happy woman in suit smiling using laptop for work in vintage interior Happy pretty woman recieves positive news via cell phone, has conversation with colleague, dressed in black formal clothes, satisf Three young women sisters use gadgets and communicate with each Portrait of black curly girl in park with laptop Beautiful girl calling by cell phone sitting at table with laptop in restaurant Technology and communication concept. 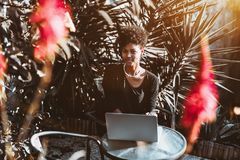 Successful African American businesswoman with Afro hairstyle making phone calls with seriou Portrait of happy mixed-race long hair asian half Thai-American Asian woman using smart phone with blur green garden background.